Dancers The Boston Dance Alliance is holding its annual Open Call Audition on September Sunday, September 18, 11 a.m -5 p.m. at Brookline High School. Learn more to register. Western MA Artists Vendors and Crafters that make handmade creations are sought for the Lenox, MA, Holiday Craft Connection, November 19, 2016 from 9 am – 3 pm at The United Methodist Church of Lenox, 6 Holmes Road, Lenox, Massachusetts (located behind NBT Bank). Free admission. For more information please call 413-243-2640 ~ 413-464-2659 or alliekatt0328@verizon.net. Filmmakers Sundance Institute is is accepting applications of short and feature length films, episodic content, and virtual reality projects to the Sundance Film Festival in Utah. Learn more. Artist Residency The Kimmel Harding Nelson Center for the Arts in Nebraska City, NE offers 2- to 8-week residencies year-round for writers, visual artists, and music composers. Housing, studio space, $100/week stipend are provided. Visual artists work in one of three studios, two of which are approximately 425 square feet and one that is 258 square feet. Onsite letterpress studio also available. Learn more. Fellowships in the Creative Arts The Harvard University Radcliffe Institute Fellowships awards fellowships of $75,000 each, office space at the Radcliffe Institute, and access to the libraries at Harvard University. The fellowships are given annually to artists in a variety of disciplines to allow them to pursue creative projects. Fellows are expected to reside in Boston during the fellowship period, which lasts from September through May. Learn more. Visual Artists Business Grant The Clark Hulings Fund Business Accelerator Grant is now accepting applications. The fund offers targeted financial assistance and business support to professional visual artists to help them boost their careers and succeed as managers of their art businesses. Applicants must detail exactly how the grant would help them undertake, improve, or expand a specific project. Grants vary, but total funding for one year will not exceed $10,000. Learn more. Call for Art The Billboard Creative is currently accepting submissions for the 2016 Los Angeles Exhibition. The Billboard Creative is an all-volunteer nonprofit that produces public art shows on billboards throughout Los Angeles. Imagine your art viewed on a massive scale, by tens of thousands of Angelenos on their daily commutes. Public art displayed in a quintessential Los Angeles medium. Learn more. Music Performers Do you believe in the power of free, live music to bring people together and invigorate community life? Does your town or city have an underused public space that would be ideal for outdoor concerts? Apply for a 2017 Levitt AMP Grant Award. Applications are now open. Learn more. Award for Female Writer A Room of Her Own Foundation is currently accepting applications for their Gift of Freedom Award. A prize of $50,000 is given biennially to a female poet, fiction writer, or creative nonfiction writer to complete a project for publication over a two-year period. The top finalist in each of the two remaining genres will receive $5,000. Submit up to 10 pages of poetry or prose, an essay on financial status, an essay on the meaning of writing, an artist’s statement, a project plan, and a community benefit proposal. Learn more. 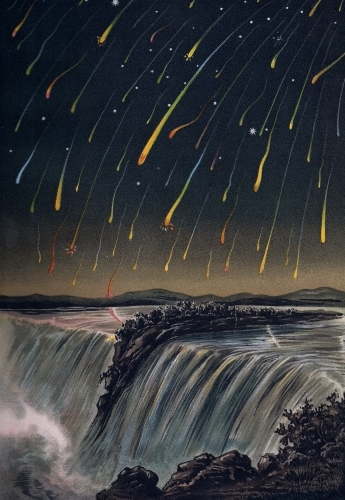 Image: Leonid meteor shower over Niagara Falls, from BILDER-ATLAS DER STERNWELT (translation: Image Atlas of the Star World) by Edmund Weiss (Stuttgart, 1892). Courtesy of the U.S. Naval Observatory Library.